Fernando Alonso, painstakingly subject to his McLaren-Honda team’s awful car every week, can’t escape the back of the Formula One field. 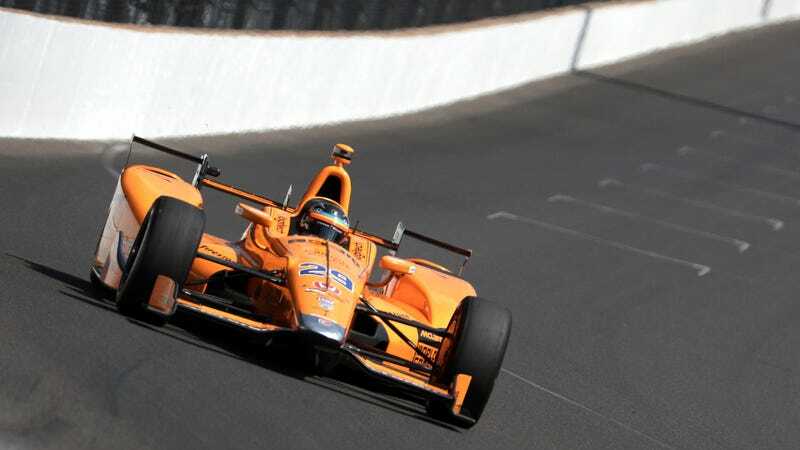 But by hopping into a car he’s never raced before for the Indianapolis 500 and running at the top of the field, Alonso’s reminding us just how amazing of a driver he is. Sure, we can all talk about how Alonso is a “legendary” racer and the best driver in the worst car, but sometimes those claims feel less tangible because of his terrible F1 car putting him at the back of the pack every single race weekend. After all, no one is going to listen to you when you say a driver is the best there is and said driver has a whopping zero F1 championship points when compared to the championship leader’s 129. But skipping F1’s famous Monaco Grand Prix on Sunday and heading into the Verizon IndyCar Series for the first time ever—in its biggest race of the season, no less—is probably the best thing Alonso could have done in the big picture. He qualified fifth, has spent a lot of the race thus far swapping out the top spot with 2016 race winner Alexander Rossi, and he’s pretty much the class of the field in a car he made his first laps in just a few weeks ago. That is the Fernando Alonso you tell your friends about when they ask why you wake up at 6 a.m. to watch skinny race cars that sound like wasps race around a track more that 20 times a year, that is the Fernando Alonso you call the best in the world, and that is the Fernando Alonso F1 deserves. But that’s not the only opinion out there about Alonso being at the top of the field in the Indy 500. Some, like Alonso’s fellow F1 competitor Lewis Hamilton, think IndyCar drivers just aren’t very good. It’s all relevant to whom you’re competing against, it seems, but think about it: A standard chassis and fairly standard engine, rather than all different types of performance and a terrible McLaren-Honda engine, seems like a better platform to judge a driver’s capabilities on than the current scene in F1. Either way, Alonso’s running third as of lap 107 of 200, is the only “rookie” in the top 22, and could easily win this race—something we haven’t said about him in F1 for quite some time. What a day that would be for him, and what a difference a good car makes. Update, May 28 at 4:10 p.m. ET: Nope.